If you’re still in the market for a Windows 7 PC, you can breathe a sigh of relief. They’re still available. ”We have yet to determine the end of sales date for PCs with Windows 7 preinstalled,” Microsoft told Neowin.net. 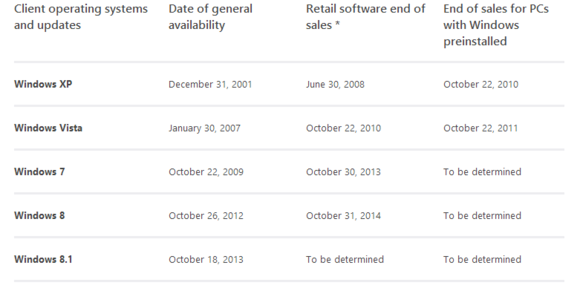 “The October 30, 2014 date that posted to the Windows Lifecycle page globally last week was done so in error.” So far, Microsoft hasn’t said when it will cut off Windows 7 PC sales, leaving the issue unresolved with a “to be determined” tag. That’s important, given that Windows 7 remains Microsoft’s most popular OS—and actually scored a small increase from October to November in the most recent market-share compilation by Net Applications. Windows 7 holds a 46.64 percent market share, compared with 31.2 percent for Windows XP, and a devilish 6.66 percent for Windows 8. With the upcoming end of support for Windows XP, Microsoft is urging businesses and other customers to abandon Windows XP and move to a more advanced operating system—and those customers are turning to Windows 7, instead. Ordering PC makers to discontinue sales of Windows 7 PCs would be a drastic measure. As Gregg Keizer of Computerworld noted, even the retail end-of-life for Windows 7 doesn’t mean much: online retailers have continued to sell packaged copies, sometimes for years, by restocking through distributors which tucked away older editions in a warehouse. That’s probably true for Windows 7, at least assuming that those PC makers have a stash of license keys set aside, as well. Still, it’s good news for those who aren’t willing to make the leap to Windows 8, but still want to live in the Windows world.